For the first time, farmworkers in California will soon be entitled to the same pay as other hourly workers after California's governor signed an expansion of a labor policy. Gov. Jerry Brown's announcement came decades after labor leader Cesar Chavez and the thousands of farmworkers he organized pushed officials to recognize the union of agricultural laborers. The legislation will require that farm employers pay workers one and one-half times regular wages pay after eight hours in a day or 40 hours in a week, rather than the rate enacted in 1975 of 10 hours in one day or 60 hours in a week. "We've been able to break the barrier for farmworkers here in California," United Farm Workers President Arturo Rodriguez said. He called it precedent-setting, but declined to say when or where the UFW would seek to expand its efforts. "We were fighting hard just to get this one first." Even in a state with a Legislature controlled by the Democratic Party, there were no assurances the measure would pass. Farm owners and agricultural associations, as well as some outside farm groups, are overwhelmingly opposed to the change because they argue will make overtime unaffordable and lead to fewer hours for individual workers. "The bill hurts both farmers and farm workers and will result in increased grocery bills and farmers leaving California," said Sen. Jeff Stone, R-Temecula. But an ongoing shortage of people willing to sow and harvest fields in California means one thing for employers, Rodriguez said: Either pay workers overtime after eight hours or risk a lower yield. Brown's signature on the bill, which came without comment from his office, came 41 years after he first oversaw implementation of a farmworker overtime policy as governor in 1975 when the state Industrial Welfare Commission ordered agricultural employers to pay workers overtime. It came on the heels of the nation's largest agricultural labor strike that saw thousands of workers walk off farms in 1970 and picket for farm owners to negotiate fair labor conditions with the UFW, established by Cesar Chavez. When he returned to the governor's office in 2011, Brown was again confronted with a debate over farm-labor relations. 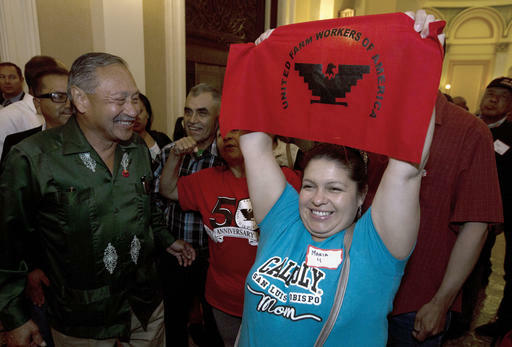 Rodriguez and Democratic leaders in the Legislature pushed a bill to make it easier for a group of farmworkers to unionize by recognizing them after a majority signed up, without a formal vote and the accompanying certification process. Brown wrote in a message vetoing that legislation that he appreciated the frustrations that gave rise to the proposal, but he was not convinced the sweeping changes were justified. Fast-forward five years to Brown's unprecedented third term as governor, and he chose to stand in favor of agricultural labor rights. Brown gave no indication of where he stood on the issue this year as hundreds of people came to the Capitol to rally for and against it. A spokeswoman for the governor, Deborah Hoffman, declined to comment Monday. "We thought the governor might take time to study the implications of it, but unfortunately this became a social issue for agricultural farmers in California," said Paul Wenger, president of the California Farm Bureau Federation. The new law will be phased in beginning in 2019 and take full effect for most farms in 2022 or 2025 for small farms of 25 or fewer employees. Wenger called it unfortunate that attention to workers' rights drowned out concerns over the practicality of expanding an already historic policy. "You can't farm until the sun is shining, and when it's rainy and it's cold there's not a lot to do," Wenger said. "When the sun is shining they like to make those hours up. Now they won't be able to because I'll have to spread them between more people."